A customer relaxes at Caffe Lil Italy on Salem Street in the North End. When Dana Preda first came to the United States, she knew not one word of English. Thirteen years later, she owns one the most popular new Italian coffee shops in the North End, Caffe’ Lil Italy. Despite the success of her coffee shop, many are surprised to know that Preda still works six days a week at Antico Forno, the restaurant she began working at years ago in hopes of opening her own shop one day. She said she is saving money to help her 17-year-old daughter, whom Preda sees only once a year, emigrate to the U.S. from Romania. After following her husband to the United States 13 years ago Preda started busing tables Antico Forno. Once Preda started learning English she was able to start waitressing. She worked double shifts seven days a week for 10 years before she was able to save her earnings to open Caff’ Lil Italy. Preda said she wanted to open the coffee shop so she would have enough money for her daughter to come live and go to school in the United States after high school. She also wanted to use her creative ideas to make the best menu possible for her shop. Preda did just that. The menu includes classic Italian pastries, gelato, and a neighborhood favorite: homemade waffle sundaes. 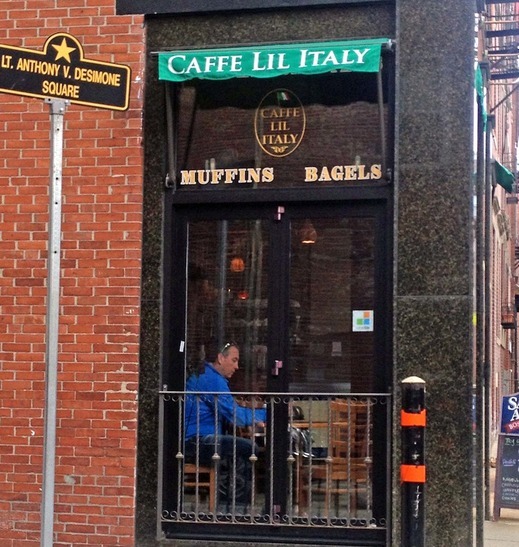 Located on Salem Street directly across from the Old North Church, Caff’ Lil Italy is now a hot spot for tourists and locals. Marlee Santoro, who works at Antico Forno, said Preda is the hardest worker she has ever known. Preda credits her many years in the restaurant business to being able to run a successful shop in one of Boston’s busiest neighborhoods. Preda says she plans to expand Caff’ Lil Italy and start selling a full lunch menu before the summer begins ‘ and she wants to provide more seating since the popularity of the shop has grown so quickly. This entry was posted in News and tagged coffee shop, Dana Preda.